It's time to hone your intuitive skills for the week! By now, you know the drill: Ground yourself, by closing your eyes for a few moments, taking 3 deep breaths, and then opening your eyes. 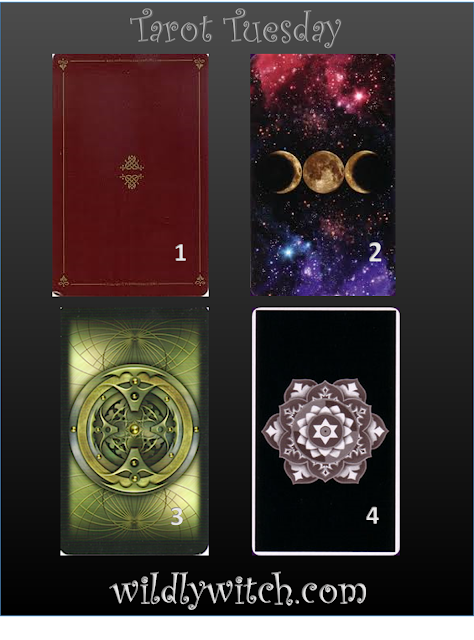 Choose ONLY ONE card. When you have the one that speaks most to you, look below to see how it resonates in your life. Ready? Let's check out the big reveal. Have you been feeling like a winner? Is there something in which you take great pride that is getting noticed? If this is the case, don't be surprised if you see the Six of Wands show up in your tarot reading. This is the card of reaping the reward, and enjoying the fruits of victory. This card stands for triumph, plain and simple. 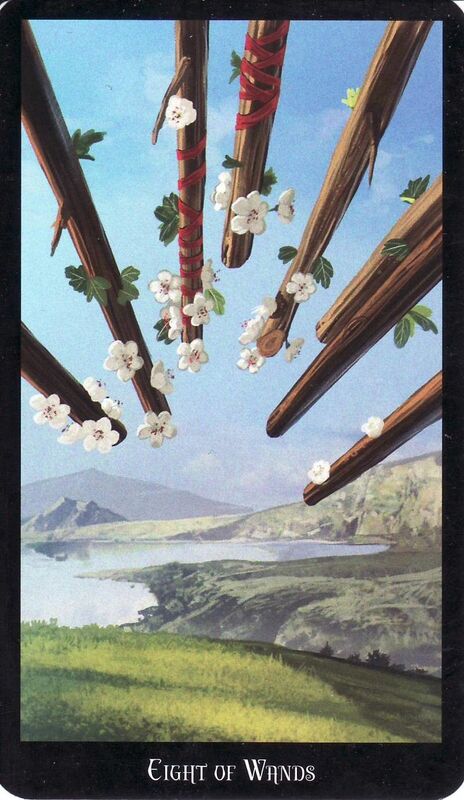 The 6 of Wands is a very positive omen. 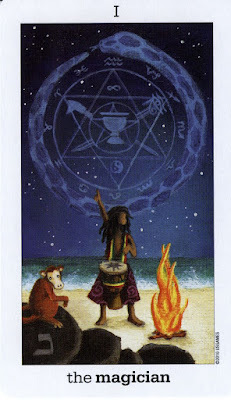 This card also points toward literal or metaphorical movement; things are changing, in a beneficial way. A Six of Wands landing in this position indicates that complete victory is at hand. 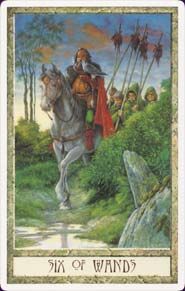 If you are seeking the Tarot reading to see if a court case or other struggle is about to be over, this is an affirmative answer delivered on horseback. If you are looking for answers as to why you are struggling with a relationship or other personal setbacks, be they career, emotional or financial, the Six of Wands demands that you consider how pride and vanity may be getting in the way of simple solutions. The news is good, but the outcome is up to you. The 9 of Cups is a very powerfully beneficial indicator for you! It represents a lasting or powerful contentment in your life. While nothing is permanent, somewhere along your life's path you can expect to be truly happy. It is heavily tied to creative endeavor, and good wishes for the future. The appearance of this card is usually a portent of happiness, and good things about to come. It also usually means that what you want is likely to come into being in your life. If asking a yes/no type of question, this card is the most powerful indicator of "yes". The 9 of Cups is also known at "the wish" card in tarot readings. It can mean that the things you've been dreaming of or hoping for are about to come your way- in a short period of time, too! This is a very powerful, positive omen in a reading. This card reminds us that we have the power to make a difference, in our lives and in the greater world, if we simply make a point to try. The Magician is about making higher and better use of all of one's power. Spiritual, emotional, and otherwise. 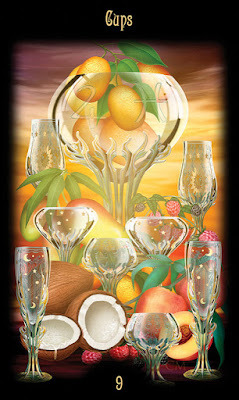 This is another card that often signifies new beginnings and great expectations. This is actual transformation of the literal and figurative world in normal ways. You are not going to have it all handed to you on a plate, but you have the potential to have that plate and a lot of what's on it if you do the magic yourself. The Magician is all about action. If you do nothing you'll get nothing. If you don't know what to do then just do something because anything is better than nothing. This card signals urgency- this is a situation of which you must seize to take advantage. In this position, The Magician indicates that your ability to be yourself and impress the right person, or people, can have a big impact on the direction your life takes. The Magician in this position is a metaphor for your free will and good luck combining in a rare opportunity to move way ahead in life. When this card is in this position, take your great leap forward. The time is now! How did you do? Are these exercises helpful? What can I do to assist you further? As always, the best conversations take place on the Facebook page, but feel free to message me, or leave a comment here. I love hearing from you!